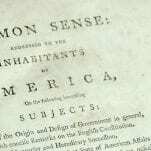 The Rights of Man Parts I & II, Common Sense, and Paine’s Letters. London: J. S. Jordan, Fleet Street; J. Ridgway, York Street; H.D Symonds, Paternoster Row, 1795-1792. 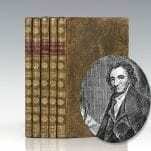 Attractively bound early set including founding father Thomas Paine’s best-known and most influential works. Titles include in full: Rights of Man: Being An Answer To Mr. Burke’s Attack on the French Revolution, Part I (1795); Rights of Man; Part The Second Combining Principle and Practice (1792); Common Sense Addressed to the Inhabitants of America (1792); Letter Addressed to the Addressers on the Late Proclamation (1792). 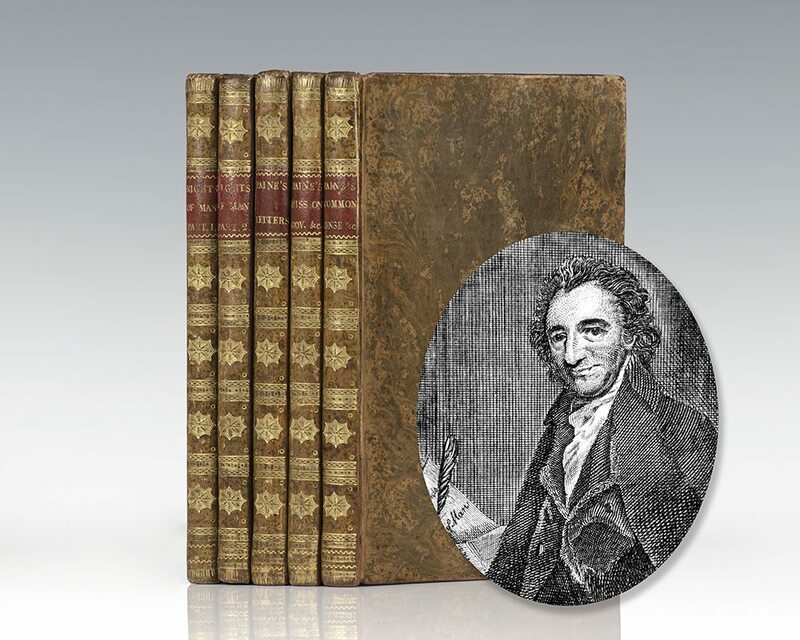 Octavo, five volumes, uniformly bound by early Boston binder J. Loring in contemporary calf, gilt titles and tooling to the spine, red morocco spine labels, engraved frontispiece portrait of Paine. In very good condition with some light toning to the text. An attractive and desirable collection. 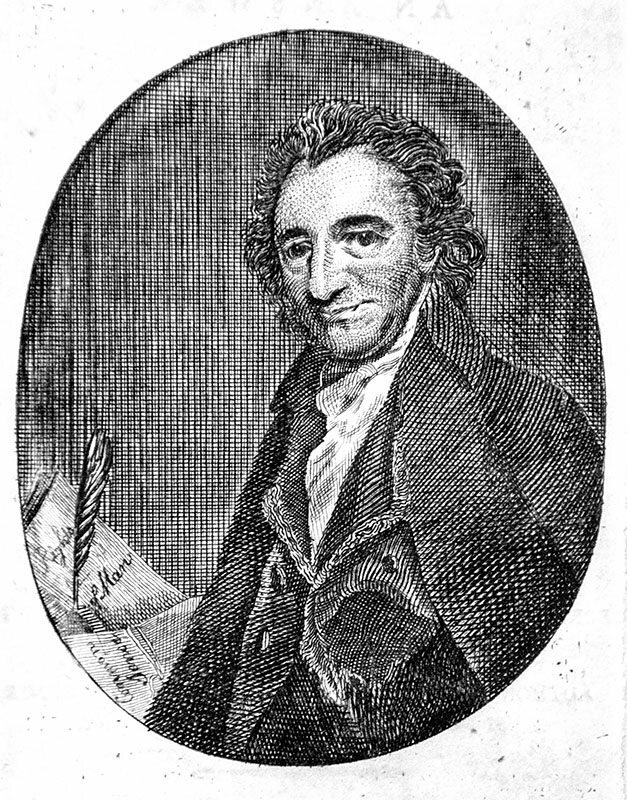 One of the founding fathers of the United States, Thomas Paine authored two of the most influential pamphlets at the start of the American Revolution, which ultimately inspired the 1766 Declaration of Independence. 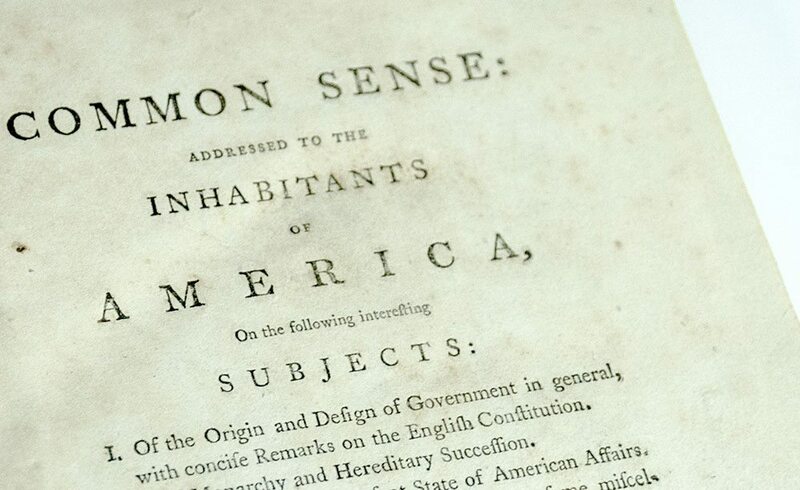 Virtually every American rebel read Paine’s powerful pamphlet Common Sense which crystallized the American Revolution and demand for independence from Britain. John Adams asserted "without the pen of the author of Common Sense, the sword of Washington would have been raised in vain." 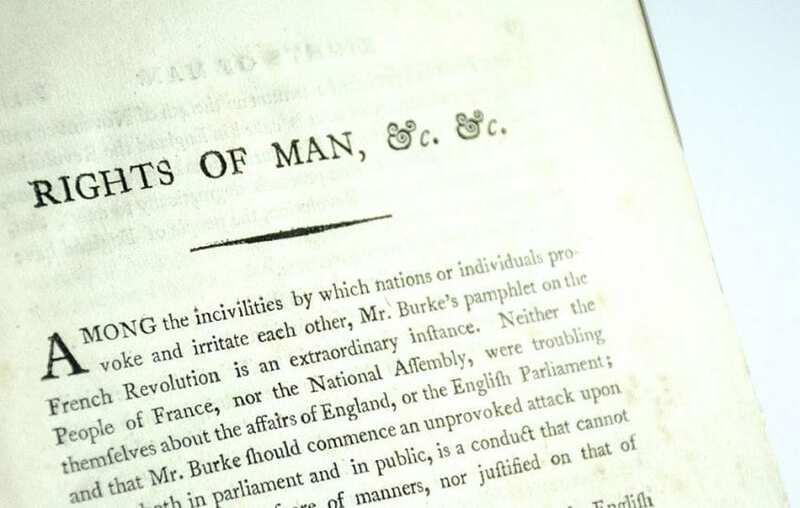 Rights of Man: Part the First Being An Answer to Mr. Burke’s Attach on the French Revolution. London, Printed: New-York: reprinted for Berry, Rogers, and Berry, no. 35, Hanover-Square, 1792. First edition of Paine’s Rights of Man. Octavo, contemporary brown calf. In good condition with some rubbing and wear. The American Crisis, by the Author of Common Sense. Exceptionally rare printing of Paine’s famous call to arms was first published in the Philadelphia Journal on 19 December 1776, and then appeared in pamphlet form four days later, soon circulating through the major cities. It begins with the immortal words “These are the times that try men’s souls: The summer soldier and the sunshine patriot will, in this crisis, shrink from the service of his country; but he that stands it NOW, deserves the love and thanks of man and woman. Tyranny, like hell, is not easily conquered, yet we have this consolation with us, that the harder the conflict, the more glorious the triumph. What we obtain too cheap, we esteem too lightly.” This edition is dated “December 23, 1776” in type at the foot of the final page. It was advertised in printer Samuel Loudon’s newspaper, the New-York Packet, on 6 February 1777 as “just published,” and a thousand copies were ordered by the New York Constitutional Convention then in progress. Loudon had been a ship’s chandler before launching his newspaper in January 1775. He fled the British army to Fishkill (in what is now Beacon) in mid-1776 and served as official state printer in addition to other projects. The printer had fled NYC from the British and was also serving as the official printer of the NY government in exile up in Dutchess County. This copy was owned by Jonathan Thompson (1773-1846) of Islip, NY, who inscribed it in 1819. He later went on to be the customs collector for the Port of New York. “A Pair of Peripatetic Printers: The Up-State Imprints of John Holt and Samuel Loudon,” in Essays Honoring Lawrence C. Wroth, page 397; Bristol B4323. 3 copies in ESTC. Octavo, original wrappers with the front panel with light dampstaining. Housed in a custom half clamshell calf and chemise box. 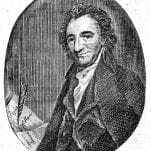 Writings of Thomas Paine: Secretary for Foreign Affairs to the Congress of the United States of America, in the Late War. Albany, New York: Charles R. & George Webster, 1792. Nine of Paine’s writings gathered, each pagination with a separate title page. Octavo, bound in contemporary calf. One of at least four issues with variant title pages for this work, this apparently the first, without the addition of “Rights of Man, Part the Second. In very good condition with some light foxing. Rare and desirable. Common Sense; Addressed to the Inhabitants of America. Albany: Charles R. & George Webster, 1791. 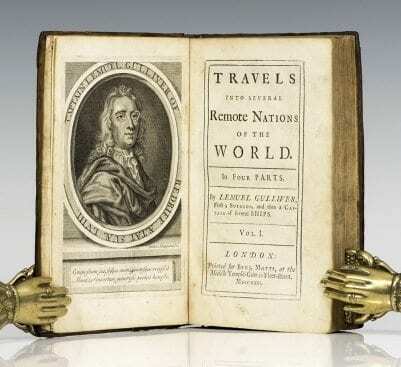 Rare early printing of Thomas Paine’s landmark work. Octavo, bound in calf over marble boards, gilt titles and tooling to the spine, morocco spine label. in near fine condition with some light toning and foxing to the text. An exceptional example. Droits de L’Homme; En Reponse a L’Attaque de M. Burke Sur La Revolution Francois. 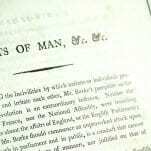 [Rights of Man: Part the First Being An Answer to Mr. Burke’s Attach on the French Revolution]. Chez F. Buisson: Paris, 1791. 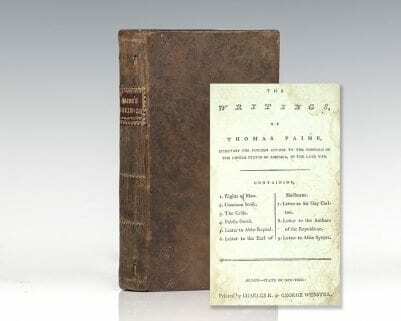 First French edition of Thomas Paine’s classic statement of faith in democracy and egalitarianism. Octavo, bound in contemporary one quarter calf over marbled boards. In very good condition. From the library of Virginia bibliophile and historian Christopher Clark Geest with his bookplate to the pastedown. Rare and desirable.